This is a guest post from Mikhail Dubov, founder and CEO of Chattermill, a data analysis company that specializes in customer experience management. It would not surprise you that your happy customers are more valuable to you than unhappy ones. That is the cornerstone of the Net Promoter Score methodology and has been proven by companies such as Amazon, Apple and airbnb(link) over the years. Yet, you might not be aware just how much more valuable promoters are. Eddie Yoon, of Cambridge Consulting, estimates Super Consumers i.e. the your product’s 10% biggest fans, can account for 30 – 70% of sales. Promoters stay with the brand longer and are less price sensitive. They are also some of the cheapest customers to acquire because they were probably already on the lookout for your product before it was even available. “Most people have just a single stapler—or maybe two, one at home and one in the office. But in our work we identified stapler superconsumers, who own eight staplers each, on average. These consumers don’t do more stapling than other people. Their stapler buying is related to a need to be highly organized. Word of mouth growth is the holy grail of modern marketing. As paid customer acquisition becomes more and more expensive, it is even more vital to achieve the biggest bang for your marketing buck. Your most excited customers will often mention your product to their friends and even convince them to switch. They will mention your product to friends or followers. They will share their recommend a friend code because they want your rewards. They will come and bring people to your events. They will tell their relatives to use your products. When you are developing a marketing campaign it is also far cheaper to target potential super consumers. Chances are they have already tried your product, so you have their email to get a much higher ROI. Promoters are not just a godsend for marketers. They can also help your reduce the burden from your customer service operations while increasing its quality. Successful companies have been able to create vibrant communities around their product where customers help each other solve common problems without needing a support agent. Frequently, customers actually prefer this over having to spend hours on the phone. And because they are already obsessed, your super consumers will often do a much better job than your average support person. Building a successful community is hard work, but it is a work that pays off handsomely. And if you are thinking “This is great for Apple but not in my industry” you are probably wrong. GiffGaff, a UK mobile phone brand, was successfully built around an incredible community in the industry where annoying conversations with offshore support personnel have long become the norm. London startup Monzo has proven community approach can work even in banking. Obviously, people are not going to discuss the details of their transactions with other customers on the forum, but you will be surprised how many problems can easily be solved this way. Both happy and unhappy customers will often venture ideas about how to make the product better. Companies often focus on the latter because this will “stop people from leaving us” whereas the former are often considered as “nice to have” features. In reality, getting promoters to buy more of your product is often a lot more cost effective. 1. Listen to promoters as well as detractors. Any feedback gathering process such as a Net Promoter Score program, a survey or a review should collect data promoters (i.e. people who give a high score) as well as detractors. We find that open ended feedback performs best because it does not harm your user experience. Try questions such as “How would you describe Product X to a friend” or “If you were to tell your friends about us what would you say?”. Your feedback analytics process should look at key reasons for promotion as well as detraction. Since promoters usually outnumber detractors (in a successful business), data volumes are quite high. The easiest way to accomplish this is to use Text Analytics software such as Chattermill. It is important to pick out both positive and negative mentions from every comment. This way you will find issues promoters (and detractors) care about the most. Make sure the insight is specific enough to convert into easy action points. 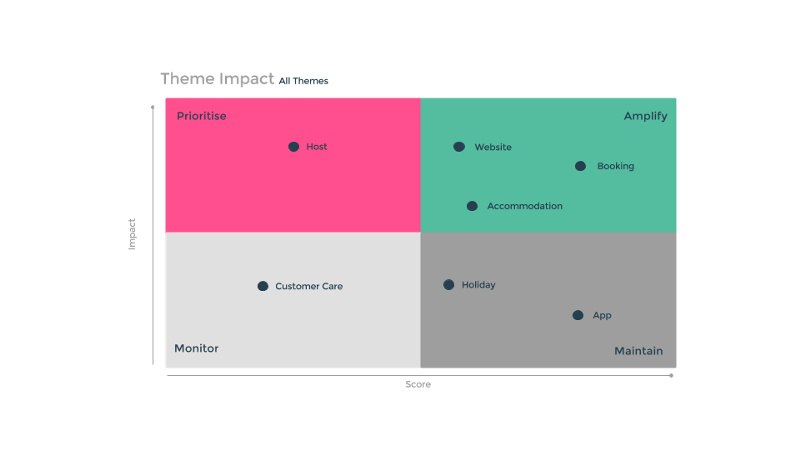 If you are in a travel industry, it does not help to know that Hotels should be your main focus. You need to know if it’s cleanliness, room quality, location or something else. The right level of detail is unique to each business. Make sure to combine insights from text analytics with customer segmentation to find specific pockets of good and bad experience. Collecting all this incredible insight is necessary to boost revenues but not sufficient. You need to act on the insight. If your insight generation process is robust, you should find 2 – 3 specific focus areas. Come up with top 3 actions for each one. At this stage, and not before, it helps to read a sample of comments falling into a specific category. Don’t fall into a trap of doing exactly what the customers have asked for. This sounds great on paper but frequently customers can’t articulate the real problem. They may ask you for a proverbial “faster horse” and it is up to you to figure out what really bothers them is speed not the exact mode of transportation. By now you should have about 6 to 10 actions. Again, pick the top 3, this time using your own team’s judgement. There you have a priority list for the next month but bear in mind, actions do not necessarily mean fixing a problem. While the actions are implemented it is important to keep tracking customer sentiment on each of the three areas to see if they are having the desired effect. At the end of the month (or however long your iteration cycle takes), you can confirm the results. Profit effects can usually be seen about 2 – 3 months in the future. At Chattermill we help companies get maximum insight from their customer feedback. 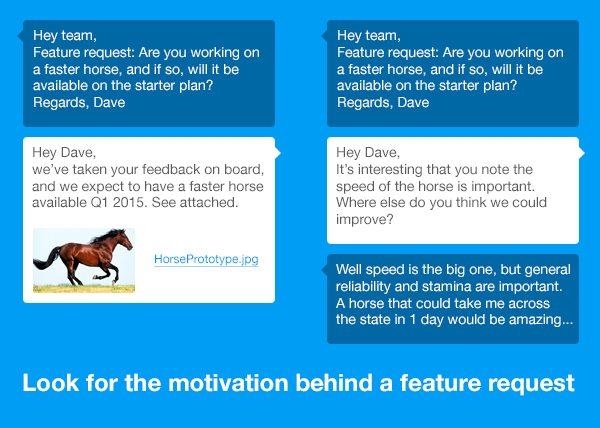 Get in touch to see how we turn customer feedback into insights.